MDS Computers: Fast, Friendly Computer Service in Myrtle Beach. 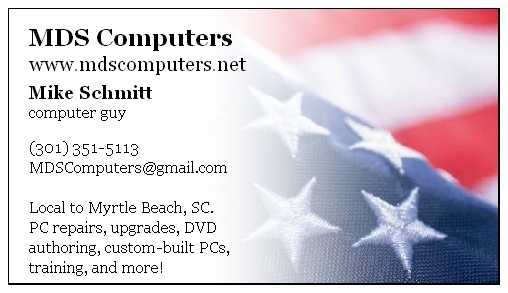 I am local to Myrtle Beach, South Carolina, and have been working for the past 6 months as a Dell on-site customer service technician. I provide a variety of in-home computer services, and otherwise, I'll take on almost any computer project requested of me. My rates are fair (and in some cases flexible depending on the job). Click here for more info. Read my recommendations on software or services you might want to use! If you have any questions or comments (or any quick tech support questions), just E-mail me!